Let’s talk about cake for a second. Okay, I lied. Let’s discuss cake for more than a second. If I had it my way, I’d only talk about cake. All the time. That’s the only thing thing on my mind. If someone asked me a specific question or was talking to me about a completely different topic, I’d respond simply with “CAKE!” I’d just shout it out to them. Scream it to their face. Part of me wants to do it just because I’d like to see what their reaction would be. The other part wants to do it because I love cake. I wouldn’t even care if it made sense or not. Cake makes perfect sense. ALL THE TIME. In reality, if I could, all I would talk about is butter and sugar and cinnamon. Talk about a love affair. Those three ingredients have my heart. Forever and always, I’ll never say no to them. Butter and sugar and cinnamon together is the stuff dreams are made of. Put those three together and I kid you not, you could solve all of the world’s problems in one easy swoop. Seriously though, it would make the world a better place. Just imagine if criminals had a piece of cake before they committed their crime, they’d change their mind and wouldn’t go through with it. That’s how good cake is. That’s the power of the cake. I’m probably exaggerating a tad. I mean not all criminals would change their mind after eating cake. But I’m sure a select few would. I say, give everyone cake. Cake for all. I’ve been on a savory kick lately, as you can probably tell from the last couple of posts. I mean sure, potato tacos are freaking delicious. I ate about fifty of them, and I’m not even joking. Okay, I’m joking. It was more like forty-nine. Calzones? Why not? Give them to me. On cold rainy days, panini and roasted tomato soup is sort of my jam. But with all that being said, cake (cinnamon, sugar and butter) well that’s just hands-down-no-contest, a sure fire winner for me. All I want to do lately is stuff my face with cake. Cake of all kinds. If you subscribe to the newsletter, you’ll have noticed the chocolate bundt cake recipe I included in it. Ate all of that without even a second thought. If you read the newsletter—which you should have by now because I sent it out at midnight. What are you waiting for? !—you’ll also know that it was my sister’s birthday this week. Of course I made her a birthday cake. It was a chocolate hazelnut cake with a nutella filling. Ate it. Stuffed the whole thing in my mouth. So when I decided to swing things back to sweet on the blog, the only logical thing to make and shoot and share was a cake. Duh. Cake for life. I immediately thought to myself that all I needed in life at that very moment was sugar, butter and cinnamon. 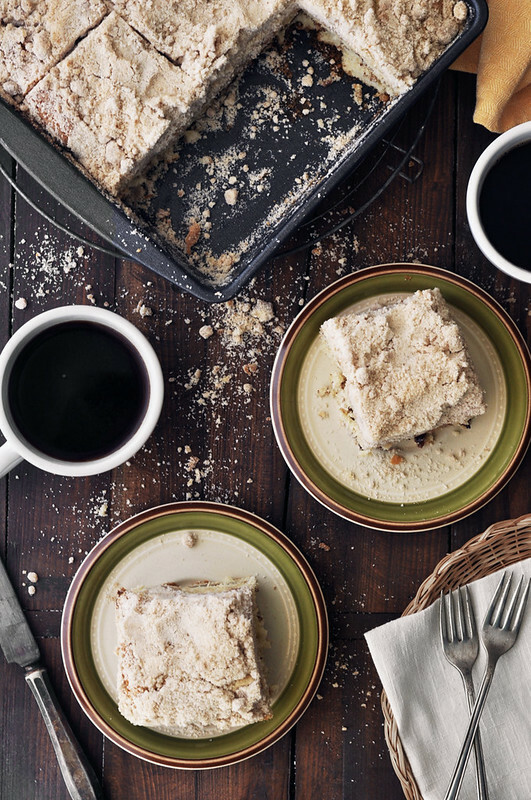 So guess what…I made a cinnamon sugar coffee cake. I wanted it to be simple and yet a classic recipe that you guys would want to make. 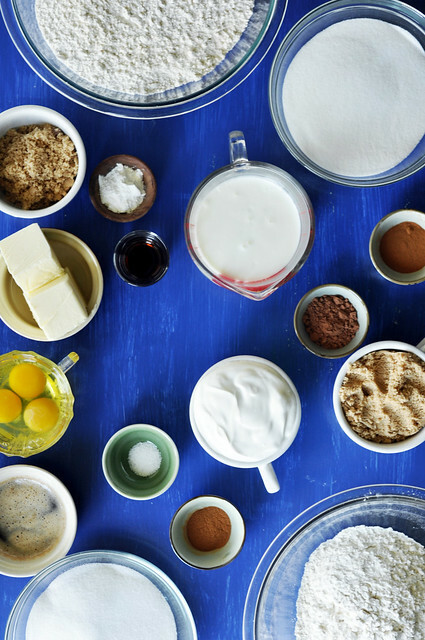 I hope you want to make this cake because let me tell you, it’s a delicious breakfast cake. I should make an entire cookbook of breakfast cake. I’d call it “Yes I’m Eating Cake For Breakfast And No You Can’t Have Any.” Or something like that, it’s a work in progress. It would give me an excuse to recipe test and eat nothing but cake for breakfast without people judging me. (Like my mom and doctor). I’d say, “I’m just working on the book. I have to eat this cake because it’s research!” We’d all have an excuse to eat cake first thing in the morning once the book came out. I’d be the reason every kid (and a few adults here and there) would be demanding cake for breakfast. I’m okay with that. I could live with myself. Gimme that cake.